A busy intersection in the North County has gotten a bit of a facelift in the name of pedestrian safety. The San Diego Association of Governments (SANDAG) and the North County Transit District (NCTD) just finished up some pretty big improvements for the stretch of road along Chesterfield Drive. The main goal was to increase safety, walkability and bikeability. There's now a bikeway and pedestrian path, wheelchair accessible sidewalks and ramps, new traffic and rail signals, plus a warning and alert system for people crossing the street. 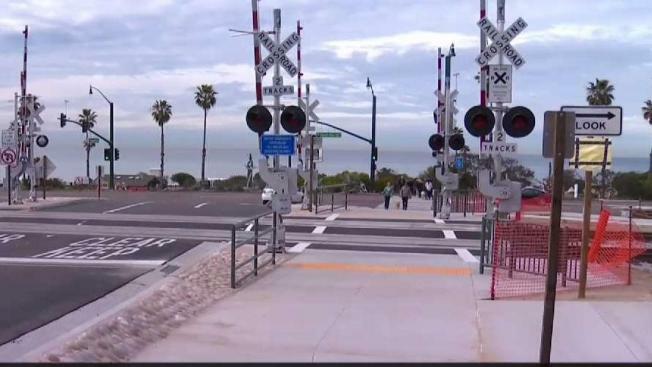 The new rail crossing at the intersection also meets the requirements for the future quiet zone project for Encinitas. Trains will stop sounding their horns as they come through that half-mile stretch of Cardiff. The rail crossing also has added signals and gates. Pedestrians use this walkway to get to and from the beach and appreciate the added safety. "It'll be interesting to see it in the summer when the traffic really gets going because we're pretty light right now on traffic," said Susan Connelly who lives in Cardiff. The project is one of many here happening in the North County under the North Coast Corridor Program. It’s improving highways, rail systems, and access to the beach, to name a few of its goals.